Investment in Waikiki’s only locally owned and operated beachfront hotel will continue the company’s commitment to sharing Hawaii’s unique history and culture. Outrigger Enterprises Group today announced a $100 million investment to revitalize the oceanfront Outrigger Reef on the Beach in Waikiki. 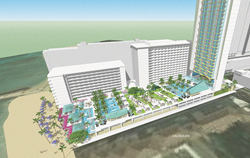 The planned renovation will open vistas to the ocean at Outrigger Reef on the Beach by razing an existing five-story structure located on the beach and replacing it with 34,000 square feet of open recreation space, inclusive of enhanced swimming pools, landscaped lounging areas, and open-air dining facilities. A new tower, set back from the shoreline along Kalia Road, will add more than 200 full-service hotel rooms to the property. In addition, removal of the existing building along the shoreline will dramatically increase ocean vistas and open space. The new hotel structure will incorporate materials, features and technologies that increase efficiency and sustainability. Outrigger Reef on the Beach will also add 15,000 square feet of new meeting facilities to accommodate the currently underserved small to mid-size meetings market. The revitalization will provide much-needed, new hotel rooms in Waikiki at a time when hotel room reductions are regularly being announced and is estimated to result in 400 new construction-related jobs, 100 new hotel operations jobs, $235 million in new spending, and $700,000 in additional real property taxes for the City and County of Honolulu. Entitlements and permits are expected to be completed in approximately three years, with construction beginning in 2017 and slated for completion in 2019.